The Hannover Rück is, with a premium volume of 14.4 billion euros, one of the five largest reinsurance groups in the world. It operates in all divisions of claims, personal and financial reinsurance as well as the program business and is, with some 2,900 employees, represented on every continent. Founded in 1966. the Hannover Rück Group now has more than 100 subsidiaries, branch offices and representative offices around the world. 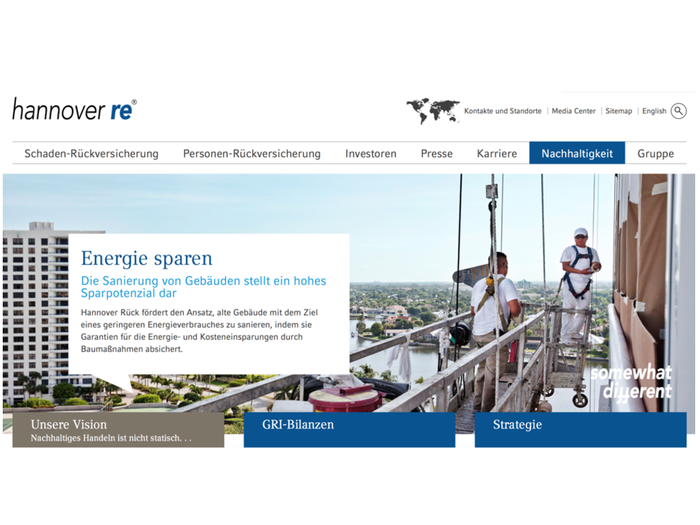 For the creation of new web applications such as a digital marketplace for every employee, Hannover Rück could not avoid the subject of responsive design. The ultra-modern and extremely user-friendly design created by an agency was implemented by Infopark. With the adaptation of the user elements for differing display sizes, the applications offered by Hannover Rück can be easily used on various end devices, even mobile. The frontend flexibly adapts to the specific device, the conditions of the screen and even to the differing entry methods. The CMS Fiona content management system is the basis for the new solution. It provides the company with flexible building blocks for application-oriented home pages, including a responsive implementation and integration of defined design aspects. With Ruby on Rails as the basis, Hannover Rück profits from short development times and maximum flexibility. Since the introduction of the new CMS, the group has successfully relaunched a number of websites and web applications. Amongst these is the separate blog https://www.dualesstudium-hannover-rueck.de, by the work/study students in the group.